If you forgot Windows 10 administrator password, how to do if you don't want to lose data or reinstall the system? This tutorial will show you how to recover a forgotten Windows 10 administrator password easily. As we know, users can create a Windows 10 password reset disk to prevent a forgotten password. You can use it to easily reset password when you forgot. But, you wouldn’t come here if you have done that. 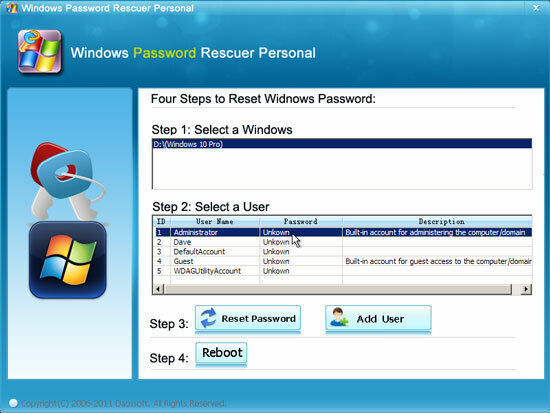 Here is an available Windows Password Recovery Tool can help you instantly reset your lost password. 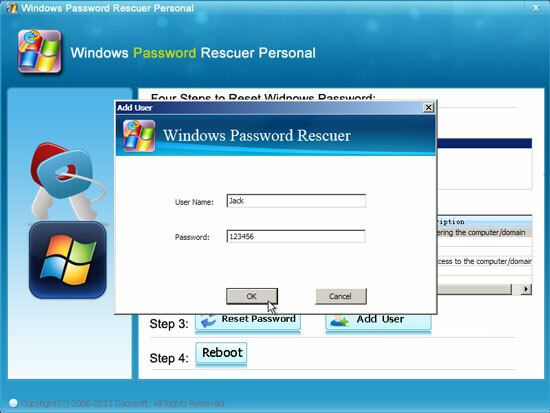 Windows Password Rescuer Personal is a universal Windows password recovery software that it can easily recover windows 10/8.1/8/7/Vista/XP/2000 password with CD, DVD and/or USB Flash Drive, including Windows local administrator and user password. It also can be used to Add Windows user account without logging. To recover Windows 10 administrator/user password, you just need a bootable CD/DVD or USB flash drive/pen drive. 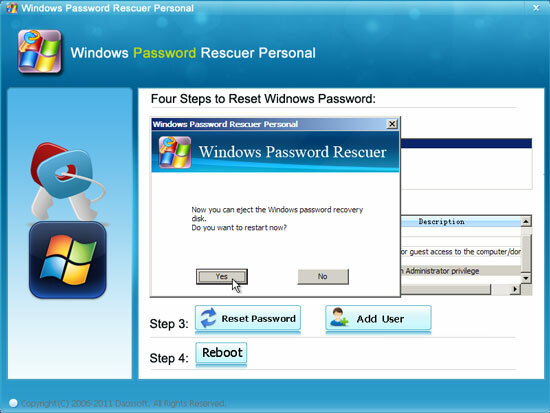 Step 1: Create Windows Password Recovery disk on "another computer"
Purchase Windows Password Rescuer Personal( to reset unknown password and add new user ) and then install it on any other available computer (Windows 10, 8.1, 8, 7, Vista, XP, server 2019, 2016, 2008, 2003, 2000). Windows Password Rescuer Personal trial version can only display all user accounts of your computer but cannot reset password or add user. 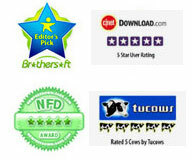 Run the software and insert a blank CD/DVD or USB flash drive. 1. 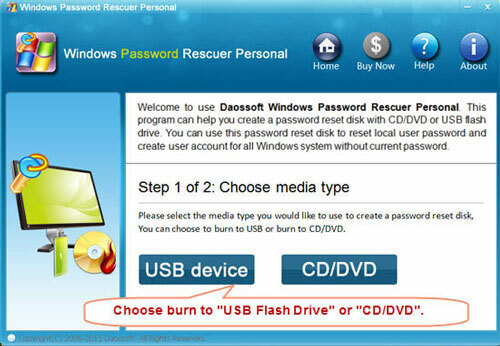 Choose CD/DVD or USB Device option. 2. 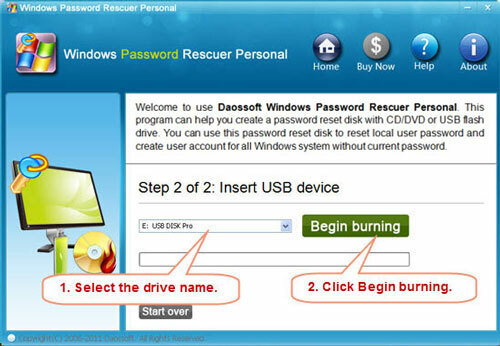 Select the CD/DVD or USB drive name which you inserted to, click Begin Burning. It will take you about half minute to complete burning. Then take out the disk and transfer it to your locked computer. Step Two: Reset Windows 10 Administrator/User Password by a few clicks. Using the bootable disk to boot your locked computer. In this step, you need to change the devices boot order of your computer. How to set computer to boot from CD/DVD-ROM. How to set computer to boot from USB Drive. 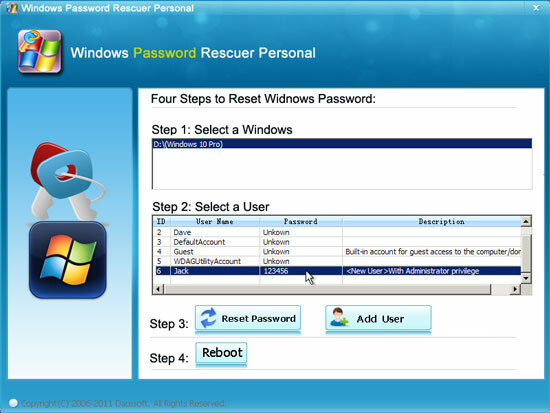 After the computer booting from CD/DVD or USB, Windows Password Rescuer Personal will run automatically. 1. All Windows 10 local user accounts will be shown in list. Click one you want to reset its password (Here we take administrator for example). 2. Click Reset button and confirm. 3. The administrator password will be removed and show "blank". Right, you have successfully changed your forgotten Windows 10 administrator password to blank. 4. Now click Reboot, take out your bootable disk, then you can login Windows 10 administrator without password. Additional: Windows Password Rescuer Personal allows people to add a user account(Administrator) for Windows 10 easily. This is a good way for you to get back into Windows 10 when you were locked out. 1. Click Add User button, when a dialog appears, type in a new user name and password, click OK.
2. New user "Jack" with password 123456 has been created. 3. The same as above, click Reboot button and take out your bootable disk. After restarting, you can login the new user account with new password.